Does it matter if the generator is GFCI (ground fault) protected, and what is the difference between a “bonded-neutral” portable generator and a “floating-neutral” portable generator? Are Reliance Pro/Tran® transfer switches automatic? Are Reliance Pro/Tran® transfer switches pre-wired? Can I connect my water heater or central air conditioner to a Reliance Pro/Tran® transfer switch? Can I hardwire my Reliance Pro/Tran® transfer switch instead of using a power cord? Can I make a splice in my main breaker panel? Can I use a generator whose wattage exceeds the wattage on the Reliance Pro/Tran® transfer switch? Can I use a Reliance Pro/Tran® transfer switch on any 20-amp circuit in my house? Can I use my 8000 continuous watt generator with a Reliance Controls transfer switch rated for 7500 watts? How long does it take to connect a Reliance Pro/Tran® transfer switch? How many double-pole 240 volt circuits are provided on each Reliance Load-Side® transfer switch? What is a Loadside® transfer switch? What is the maximum load on each side of the Pro/Tran® transfer switch? Which Power Inlet Box can I use with each Reliance Pro/Tran® transfer switch? What type of connection is required to connect my generator to my Reliance Pro/Tran® transfer switch or Power Inlet Box? What is the difference between the Reliance Pro/Tran® Series and the former Gen/Switch™ Series transfer switches? Where can I find a 200 amp Double-Pole, Double-Throw switch? Why can't I just run extension cords from my generator to my appliances? Why does the whole generator GFCI trip on my Honda generator when I use it with my transfer switch? Can I use one of Honda’s new i-Pro EB Series inverter generators with a transfer switch? Are individual branch circuit breakers included with Panel/Link® transfer panels? How does a Reliance Panel/Link® manual transfer panel differ from a standard Load-Side® transfer switch? What are the available configurations of the Panel/Link®? What type of circuit breakers can I use on the Panel/Link®? 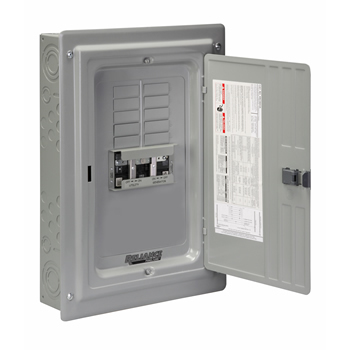 Which power inlet box can I use with a Panel/Link® transfer panel? Most portable generators will come in 2 primary types, defined by the internal wiring of the generator related to the neutral and ground. The neutral and ground are either tied together, or separated, inside the generator. A generator with the neutral and ground tied together is referred to as a "bonded-neutral" generator. It might also be described as "neutral bonded to frame". A generator with the neutral and ground isolated and separated from each other, is referred to as a "floating-neutral" generator. Certain industrial/commercial generators must be “bonded-neutral” to pass OSHA inspection on job sites, which is why there are many generators with this bonded-neutral attribute. Some of these bonded-neutral generators also might have GFCI protection built-in, due to another requirement on job sites related to ground fault protection. It’s important to identify these generator attributes at the time of selecting a generator and transfer switch, because it’s possible that some job site generators with GFCI protection will require a special type of transfer switch installation. Please contact the generator manufacturer to confirm if the generator is bonded-neutral and if the receptacle being used is GFCI protected. 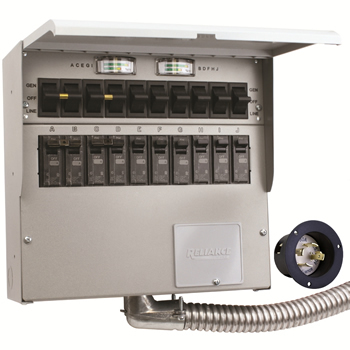 The Reliance X-series neutral switching panels are ideal for use with certain job site generators that use GFCI protection. Note: Any Reliance manual transfer switch will work with any floating neutral type of generator sized appropriately. They are manual transfer switches designed for residential or light commercial use with a 5000-12,500 watt standby generator. Each Reliance Pro/Tran® manual transfer switch comes completely pre-wired with a Red and Black wire for each circuit, plus a white neutral and a green ground wire. Reliance Panel/Link® models are generally not pre-wired, the exception being the TRC Series suffix "P" which come with 12 pre-wired circuits including the branch circuit breakers. The Reliance Pro/Tran® "Q" Series manual transfer switches are specifically designed to handle high wattage appliances. It has provisions for one double-pole 30 amp circuit for operating 250 volt appliances as large as 7,500 watts. If you need to power more than one 30 amp circuit, please install a Reliance Panel/Link® transfer panel. For loads larger than 30A, such as an electric range, use a Reliance Panel/Link® manual transfer panel. Yes. Even the cord-connected models can be hardwired. 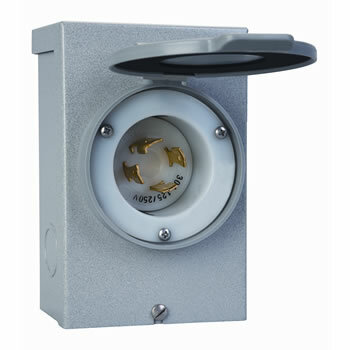 Use the cover plate supplied with every unit to cover the power inlet opening. Can I make a make a splice in my main breaker panel? Yes, under most conditions. Article 312.8 of the National Electrical Code states "Enclosures for switches or overcurrent devices shall not be used as junction boxes, auxiliary gutters, or raceways for conductors feeding through or tapping off to other switches or overcurrent devices, unless adequate space for this purpose is provided. This is acceptable for peak wattage but not recommended for running wattage. Pulling more than the rated wattage through the Reliance Pro/Tran® transfer switch could burn out the neutral wire, overheat the main wiring in the transfer switch and cause a fire. To insure proper safety precautions, a suitable double pole breaker should be installed between the generator and the transfer switch when the running wattage of the generator exceeds the rating of the transfer switch. 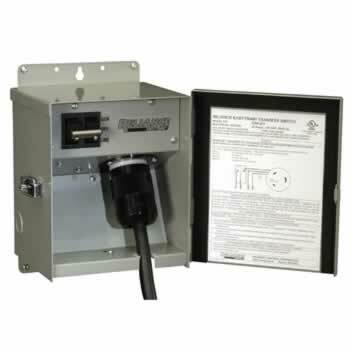 See the Power Inlet Box with Built-in Circuit Protection in the Transfer Switch Accessories section. Yes. The switches and wires in each transfer switch are rated for 20 amps. However, in the generator mode, each circuit is limited to the amperage of the circuit breakers in the Reliance Pro/Tran® transfer switch. Some of these breakers are 15 amps and some are 20 amps. The circuits with 15 amp transfer switch breakers can be connected to either 15 or 20 amp circuits in the main panel. The circuits with the 20 amp transfer switch breakers must be connected to 20 amp circuits in the main panel. The 6 circuit models have two 20-amp breakers and four 15-amp breakers, the 8 circuit models have two 20-amp breakers and six 15-amp breakers, and the 10 circuit models have four 20-amp breakers and six 15-amp breakers. Yes, as long as the generator is equipped with a 30A, 125/250VAC outlet (L14-30) protected by a 30A circuit breaker. The circuit breaker on the generator outlet will limit the output to 7500 watts. About an hour by a qualified electrician familiar with residential wiring electrical codes. If installed with a power inlet box, the installation could take slightly longer. Since each unit is pre-wired, the installer simply needs to determine which circuits will be needed during an outage, wire each set of wires in the transfer switch to those circuits, install the neutral and the ground, and test the installation under load. 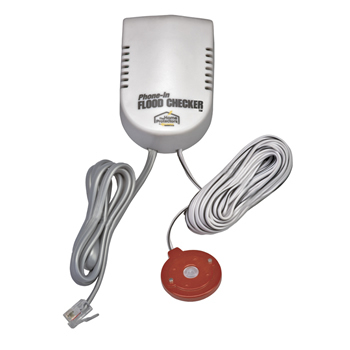 The 6-circuit models can be configured for one (1) 20 amp double-pole circuit for use on one 240-volt circuit, and are provided with one (1) handle tie. The 8-circuit models can be configured for up to one (1) 20 amp and three (3) 15 amp double-pole breakers, and one (1) handle tie is provided. The 10-circuit models can be configured for up to two (2) 20 amp and three (3) 15 amp double-pole breakers and two (2) handle ties are provided. Additional handle ties can be purchased from the factory. If no double-pole circuits are needed, the handle tie(s) may be removed and discarded. The 6-circuit and 10-circuit Q Series models are supplied with one (1) 30 amp and one (1) 20 amp double-pole breaker. If no double-pole circuits are needed, the double-pole breaker may be removed and replaced with two single-pole breakers. When your utility power is restored, other lights and appliances in your home (not connected to generator power) will turn on. To transfer the circuits on the generator to utility power, go to the Reliance Pro/Tran® transfer switch and flip the switches back to the "LINE" position and shut down your generator. Since those circuits using generator power are isolated from the rest of the house, there is no danger of back feeding the utility power. A transfer switch isolates those circuits using generator power during an outage from the utility power. This eliminates the risk of back feeding the electric utility, which can cause injuries to utility workers and property damage. A Loadside® transfer switch transfers the load after the branch circuit breakers (i.e. the "loadside" of the circuit). This allows the transfer switch to be installed without the labor and expense of moving the branch circuit breakers to another panel. It furthur allows the transfer to be made using a "light switch" type of toggle switch rather than switching a series of circuit breakers. Finally, a Loadside® transfer switch can feed some of the circuits from the utility and others from the generator. All Pro/Tran® transfer switches are Loadside®. The wattmeters on each Reliance Pro/Tran® transfer switch allow you to balance the load on each of the incoming 120 volt lines in order to gauge how much generator capacity is being used and to maximize generator performance. No meters are needed for balancing on the 4-circuit Models 15114A & 30114A since they have only one leg. Meters are not standard on the Pro/Tran™ Models 31406B, 31410B, 51406B and 51410B. They can be added at any time by installing the optional Watt Meter Panel. A four-wire, twist lock connector is needed. Reliance manufactures suitable Power Cords with a male connector on one end and a female connector on the other end. The four wires consist of two 120-volt "hot" lines, one neutral and one ground. The main difference is that the Pro/Tran® Series can easily be either hard-wired to a remote power inlet box or cord-connected to the generator, whereas the Gen/Switch™ was designed to be only cord connected. 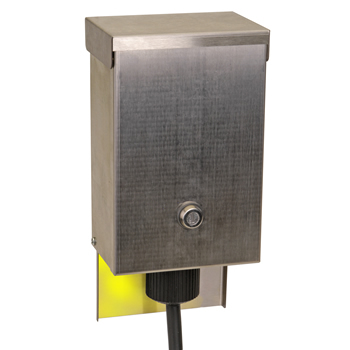 Depending on the model selected, the power inlet opening on the front of the Pro/Tran® is configured with either a power inlet or a cover plate. If configured with a power inlet, a cover plate is included for those instances when hardwiring is intended. To install a switch of this type, it is usually necessary to have your local utility pull your meter, and shut off power to your home for several hours during installation. Reliance developed a transfer switch that is installed after the mains for faster, easier installation resulting in a much lower cost. The only limitation with this method is that you cannot have all your circuits in your main panel available for generator power; a limitation most people feel is not a problem. For those that do, Reliance has developed the Panel/Link® TW Series as a less expensive alternative to the double pole transfer switch. The TW Series can transfer either 150 amp or 200 amp service and will handle generators up to 30 kW. Contact the factory for more information. This can be done as long as no connection exists between the generator and the utility and the appliance and the utility, i.e. there is no chance of back feeding the utility. However, when the generator is connected to your house wiring, the National Electrical COde requires the use of a transfer switch. The advantage of a transfer switch over cords is that you can run devices that are not cord connected such as a furnace blower motor or wall and ceiling light fixtures. A transfer switch provides the convenience of utility power and eliminates the need to run extensions cords throughout the house. A transfer switch with meters can also help in managing power and balancing the generator load to make sure you maximize the available generator power. Certain Honda Industrial/Commercial generators have the neutral bonded to ground to pass OSHA inspection on job sites. 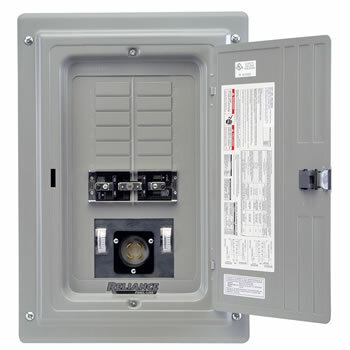 Since home or building main breaker boxes also have neutral bonded to ground, two parallel paths back to the generator are	created, one using the neutral wire and one using the ground wire. The neutral current now flows through both conductors. Since the hot and neutral wires pass through the ground fault sensor but the ground wire does not, the GFCI senses current imbalance and trips the main circuit breaker in the generator. If you want these generators to power a house or building, they must be modified by a Honda dealer. After this modification, the generator will no longer provide ground fault protection. Refer to Honda Service bulletin #20. If your generator is a Honda i-Pro EB Series inverter model, see the question below. Yes. The Reliance Panel/Link X Series is specifically designed for use with these generators. The Honda EB5000i and EB7000i models have a neutral bond that cannot and should not be removed, and therefore cannot be used for backup power applications. These generators were designed and intended for use on jobsites to meet OSHA requirements. While you cannot use these newer Honda EB i-Pro series models with a conventional 2-pole transfer switch, you may use them with one of our X Series 3-pole sequential transfer panels. Yes, with all suffix “P” models. For all other models, individual branch circuit breakers are furnished by the installer. The transfer panel accommodates from 4 to 38 circuits, and can be used with higher capacity, medium-duty generators, up to 30 kW. Some (like the TR series) are installed like a "sub-panel" after the Main. The branch circuits you want to run on the generator are typically relocated from the main panel to the transfer panel. Each Panel/Link® transfer panel includes a linked set of utility and generator transfer breakers, but the individual circuit breakers are generally not provided. The exception is the TRC Series suffix "P" panel which comes with 12 pre-wired circuits including the branch circuit breakers. Others (like the TW series) are ideal for making your entire existing panel available to generator power. Reliance also has a full line of Generator-Ready™ Main Breaker Panels for new construction or when an electrical service is upgraded. "A" SUFFIX- Includes 2 watt meters and power inlet. "B" SUFFIX - Includes only the power inlet. "C" SUFFIX - Includes only the watt meters, no power inlet. Designed for hardwiring. "D" SUFFIX - Include neither watt meters nor power inlet. Designed for hardwiring. All of the above with an additional SUFFIX "P" - Includes all branch circuit breakers and all the necessary wiring and conduit. Different breaker combinations are designated by a number following the suffix "P" such as "P1". Other models include smaller and larger sub-panels in the TR Series, 150 and 200 amp transfer panels, and 100, 150 and 200 amp main breaker panels with up to 36 branch circuits. Meters are available as an option on all main breaker panels up to 60A. 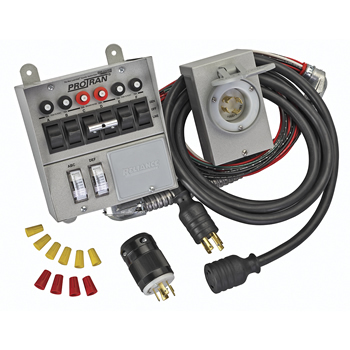 An inlet can be added to main breaker panels with generator breakers up to 50A using the optional Power Inlet Kits (see accessories section).